It is widely expected that the iPhone 5S will feature the same external design as the iPhone 5, similar to the path the ‘S’ upgrades followed in the past with no visual differences. While the iPhone 5S will still visually look the same as the previous iPhone 5, the internals will be a different story. 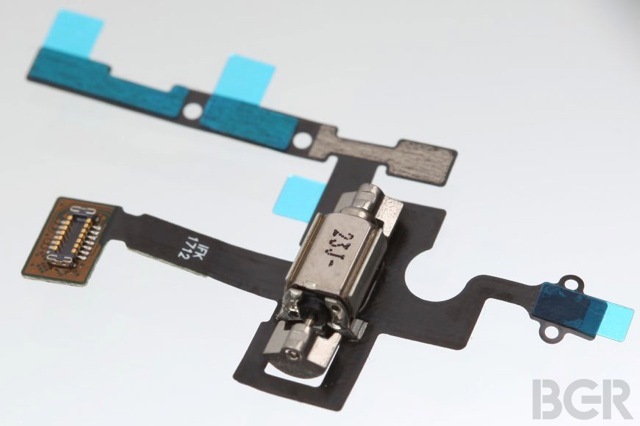 What are being claimed as high-quality images of several iPhone 5S internal component parts, the images provide a glimpse into what the iPhone 5S will have inside. Surfacing from a Media source, the images show some speaker brackets, vibrating motor assembly, WiFi flex ribbon, and a SIM card tray. iPhone 5S all but confirmed? Whilst these components are not the most exciting, and it would be a lot more substantial had perhaps the processor, camera, or RAM have been leaked to confirm rumours the iPhone 5S will in fact have increased specs, it does confirm Apple have redesigned the internals of the iPhone 5S. The fact these internals have been leaked, while relatively insignificant parts, it reveals Apple are more than likely following the regular ‘S’ upgrade pattern we have seen in previous generations of iPhone, and consequently the specs can be almost guessed as to what will end up in the iPhone 5S. The iPhone 5S is expected to launch this summer, along with iOS 7 and a completely redesigned iOS 7. This also follows the standard ‘S’ upgrade path, with a substantial software feature taking the stage and masking the relatively minimal upgrade of the hardware. It appears this will be a similar case at WWDC 2013. It had been rumoured the iPhone 6 would instead make an appearance, with Apple scrapping the iPhone 5S all together, but it appears that we’ll have to wait until 2014 to see the iPhone 6. What do you guys think? Is this something to get excited about, or are they just parts on a white background? Let us know in the comments section below.